Rotorua is the Maori capital of New Zealand and a relatively developed tourist destination. Also called Rotovegas by the locals, a bit as a joke, the town has a lot to offer and is a main stop for those visiting the North Island. 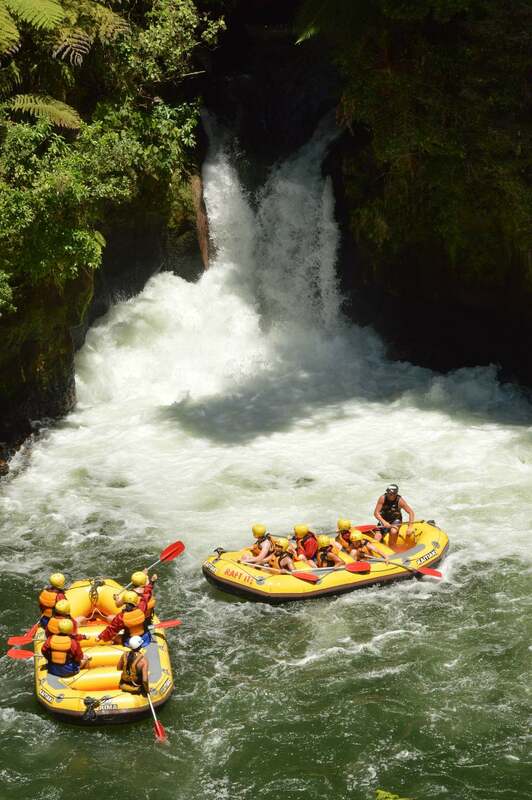 Among the adventure options available there is zorbing, sky diving, trekking up a volcano and… white water rafting. 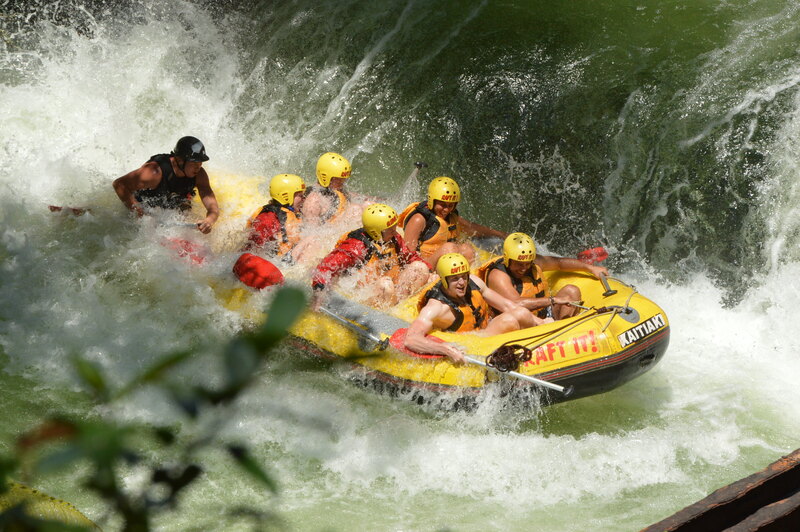 I was booked in for rafting on my way back from the Cook Islands and we were on a tight schedule. Landing at 5am from a 1,45am departure flight two days before (we crossed the date line and suddenly, a day disappeared from my calendar! ), by the time Steve picked me up from the hotel I booked for a 3 hour snooze I was in much need of some rest and was dreading the day ahead. To say that I was scared would be a major understatement, I was frightened to death to be more precise, and in no way looking forward to getting wet and cold in some raging river shower. Out of politeness to Steve who had so kindly taken care of everything I said nothing and pretended I was “cool” while inside I wished for the weather or some force majeur to screw our plans. It did not happen and so we were down with it. Say hi! Bottom left, that’s me! While we wait for our appointment, we relax on the grass and beanbags available on the gardens. There is a very chilled atmosphere. We do like everyone else and simply sit under the warm sun breathing the crisp air that fills New Zealand’s nature. It is a beautiful day to be outdoors and I feel as if I am back home in Spain on a warm spring day. We can see all the guides and the staff. They have a clear love for the outdoors and for nature, there is an air of hipster, countryside cool in the air. These guys must laugh at all the silly city dwellers coming to the countryside in search of adventure. I hide my nervousness but I am sure Steve can feel it. I pretend I am ok while inside I still hope there is a chance we don’t get to go. I keep repeating to myself that I am brave, that it’s better not to think about it and it will make for an interesting story to tell afterwards. Me being me, I am pretty sure I will do something clumsy that will make everyone laugh and hopefully, I won’t break a leg in the process. Last time I partook in one of these adventurous activities not to look like the party popper I broke my arm and ended up in hospital for a week, operated on and on medical leave for a month. I keep my fingers crossed that it was just a one-off. The moment arrives and the guides come out to brief us. We get told all the gear we will be wearing and what to expect. There will be two small 1-3m waterfalls and then a large 7m one. “It is hot out there so we will not be giving wet suits”. I curse them already. I am always cold! I yell to myself. Even when nobody else is and, comparing to a Kiwi, I am almost certainly always cold. Damn it! I keep trying to look cool. We get a plastickie jumper that will protect us from the sun. On top of it, we wear a life jacket, in case we fall in the water, we will float. We get given booties, a helmet and, for the girls, shorts to wear over our bikinis to prevent us from flashing in all the movement of the raft. I am sure it is a good option, the last thing I want is to lose my bikini as I am trying to hold on for my life to the various ropes on the raft. And then be caught on camera. Once we are all geared up I feel just like I did a month earlier when I climbed the Sydney Harbour Bridge: Not. Attractive. At all. I look at Steve. Like a good Kiwi, no jumper for him, he is boiling under the hot summer sun, I am perfectly happy with my jumper. It is time to board the bus and head to the river. The bus is full of European students who, I suppose, are traveling New Zeeland in search of adventure and adrenaline. Then there is a group of Korean and Chinese, “they are a growing group”, Jason, the owner of Kaitiaki, tells us, “the younger generations speak English and are less shy, they are willing to try anything out”. I can’t help but feel that I must be the only person here who does not want to be there. I keep wondering why I did not say anything to Steve. Perhaps I am trying to prove to myself that I am still young at heart and I can take a bit of adventure, even if I can’t control it. I am still young, in fact, when I was younger, I had no interest in crazy adventure, I always drove my car within the speed limits and my scooter at the slowest pace possible. We get to the river and the briefing continues. We grab the paddles and carry the raft on our heads down to the ramp. The lead guide then shares with us all the legends and tales about the river. 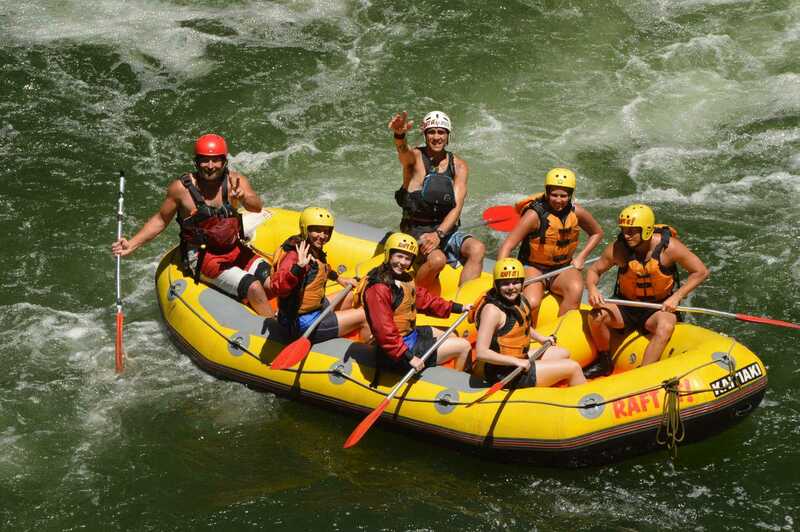 We share a prayer and say a grace then finally jump on the raft and set off. By that point I have lost all hope of getting out of there and I resign to the water’s will. The water is far quieter than I expected and we get real life tips on what to do to hold ourselves on the raft in case of rough water. 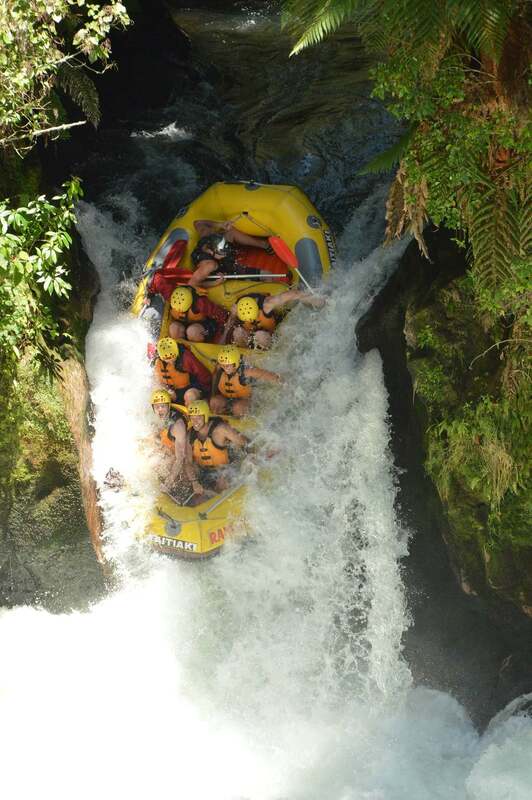 We paddle, practice some moves and trial the position we need to take when we go down the waterfall. By that point I am totally scared and the guides do not help. They make it look like everyone flips over or falls off and it is looking increasingly likely in my head. I can already see my face of complete disbelief as he pronounces these words and I try to imagine what that would feel like. I want to kill Steve. And on that thought, off we go. The first waterfall is relatively small. We lock our feet under the raft middle seats and sit down holding on tight to the ropes. Nothing at all happens and I am so concentrated and have my eyes so locked closed that I see nothing until we have passed it. I open my eyes and look back, it wasn’t too bad. We continue playing with the water, we paddle back and forth and we get to take turns in different positions. Next up is a slightly higher waterfall and we repeat the same procedure. As soon as the guide gives the sign we tidy the paddle, lock our feet, sit down and grab the ropes. We come out the other side safe and sound but completely drenched. We play some more with the water and we even get to jump off and swim with the raft. The water is not so cold and I am certainly feeling warm enough, but the adrenaline could be playing tricks on me. Back on the raft we are getting ready for the large waterfall. Instructions are repeated and I am happy that this is soon coming to an end. We finally make it through and it does feel like a lot less than 7m. We definitively get wet but the last waterfall was nothing more than a longer version of the smaller ones and it all goes so fast that I can barely feel anything. I feel relieved and proud of myself, although I recall how frightened I was 2h earlier and can’t help but be reminded that I am not really that brave. I take my unattractive helmet off – I must look like a wet chicken. My hair is messy and I am soaked in my unflattering clothes. The Swedish girls that were on our raft are happy its over, one of them admits she is shaking from the fear. I’m keeping my cool, at least on the outside. Because we are the first raft our guide rushes us out to a lookout to see the river from above and watch some people jumping into it from high points. Not for me either. Why do so many people want to put their lives in danger? Aren’t their lives good enough to keep? Back at the bus, in my wet chicken look, I am glad it is over. I can’t say that I enjoyed it, it was also not half as scary as I thought and I reckon that, should I have known in advance what was ahead, I would have enjoyed it much more. Perhaps it is something you have to do twice or perhaps they should show you a video of the waterfall parts to take away the fear. But I guess half of the people there are going in order to prove something to themselves. Often times, this is why we set off on an adventure, to search for a challenge that we can conquer. I accepted long ago that I was anything but an armchair adventurer. 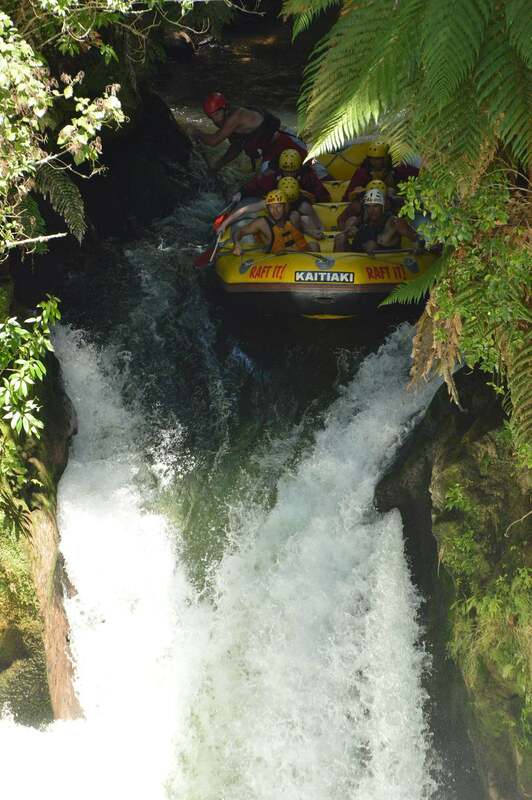 For the adventurers in you, you may even find it tame but the entire experience, thanks to the cool but knowledgeable guides, is not only safe but also an insight into the local ways of life, the Maori heritage and the area. Don’t let the adventure part take over, the historical significance of the place is equally, if not more, important.